For other uses, see Brocade (disambiguation). 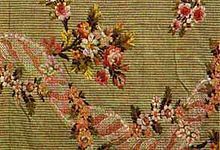 Silk brocade fabric, Lyon, France, 1760-1770. 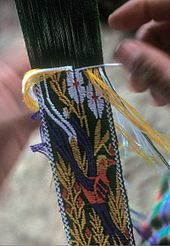 Detail of hair-sash being brocaded on a Jakaltek Maya backstrap loom. Brocade is a class of richly decorative shuttle-woven fabrics, often made in colored silks and with or without gold and silver threads. The name, related to the same root as the word "broccoli", comes from Italian broccato meaning "embossed cloth", originally past participle of the verb broccare "to stud, set with nails", from brocco, "small nail", from Latin broccus, "projecting, pointed". Ornamental features in brocade are emphasized and wrought as additions to the main fabric, sometimes stiffening it, though more frequently producing on its face the effect of low relief. In some, but not all, brocades, these additions present a distinctive appearance on the back of the material where the supplementary weft or floating threads of the brocaded or broached parts hang in loose groups or are clipped away. When the weft is floating on the back, this is known as a continuous brocade; the supplementary weft runs from selvage to selvage. The yarns are cut away in cutwork and broché. Also, a discontinuous brocade is where the supplementary yarn is only woven in the patterned areas. The manufacture of brocade began during the Warring States period of China. 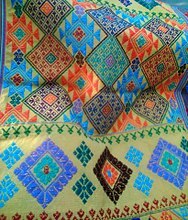 Many products of brocade have been found in tombs of the era. Dating back to the Middle Ages, brocade fabric was one of the few luxury fabrics worn by nobility throughout China, India, Persia, Greece, Japan, Korea and Byzantium. Woven by the Byzantines, brocades were an especially desirable fabric. From the 4th to the 6th centuries, production of silk was seemingly non-existent, as linen and wool were the predominant fabrics. During this period, there was no public knowledge of silk fabric production except for that which was kept secret by the Chinese. Over the years, knowledge of silk production became known among other cultures and spread westward. As silk production became known to Western cultures, trade from the East began to decrease. 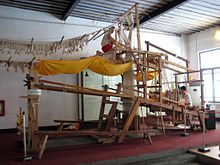 It was discovered by Byzantine historians that in the 6th century a pair of monks brought the secret of sericulture – silk production – to the Byzantine emperor. As a result, Western cultures were able to learn how to breed, raise, and feed silkworms. From this point until the 9th century, Byzantium became the biggest and most central producer for all of the Western world in the production of all types of silk motifs, including brocades, damasks, brocatelles and tapestry-like fabrics. During the Early Middle Ages, brocade fabrics were only available to the wealthiest of people as the Byzantine emperor charged extreme prices for the fabric. The designs woven into brocade fabrics were often Persian in origin. It was also common to see Christian subjects depicted in the complex weaves of the fabric. When these luxurious fabrics were made into clothing or wall hangings, they were at times adorned with precious and semiprecious stones, small medallions of enamel, embroidery and appliqués. The life of a noble[where?] during the Late Middle Ages was filled with entertainment: riding and hunting, music and dancing, and feasting. All of these activities became a stage for the display of fashion. Wealthy noblemen and noblewomen dressed in silk brocades from Italy, and velvets trimmed with fur from Germany. During the 14th and 15th centuries, the Court of Burgundy was made known for their continuous fashionable tastes and luxurious dress. Brocades were also an important fabric during the Renaissance, and especially the Italian Renaissance. As wool and silk were the primary fabrics used by Europeans during the Renaissance, and despite the lack of documentary evidence, it is said that due to the increase in complexity of decoration of Italian silk fabrics of the 15th century, there must have been improvements in silk-weaving looms around this time. The complexity and high quality of luxurious silk fabrics caused Italy to become the most important and superior manufacturer of the finest silk fabrics for all of Europe. The almost sculptural lines of the fashions during the Renaissance were paired perfectly with the exquisite beauty and elegance of brocade, damask, and other superior silk textiles. The motifs remained Chinese, Indian and Persian in origin and were a reflection of the trading between the Far East and Italy. It is said that some Renaissance painters designed and sketched textile designs for fabrics production as well as incorporation into their paintings. Brocade fabrics are mostly for upholstery and draperies. They are also used for evening and formal clothing, for vestments, as well as for costumes. The use of precious and semiprecious stones in the adornment of brocades is not common but has been replaced with the use of sequins and beading as decoration. Brocade fabrics are now largely woven on a Jacquard loom that is able to create many complex tapestry-like designs using the jacquard technique. Although many brocade fabrics look like tapestries and are advertised by some fashion promotions as such, they are not to be confused with true tapestries. Patterns such as brocade, brocatelle, damask and tapestry-like fabrics are known as jacquard patterns. 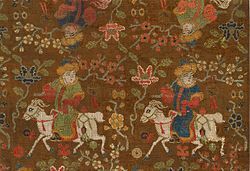 Silk brocade (detail), Boys riding goats. Ming dynasty, 15th/16th century. 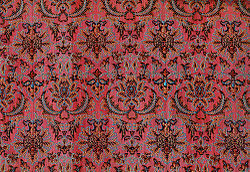 Persian Silk Brocade. Brocade weaver: Seyyed Hossein Mozhgani, 1974, Ministry of Culture and Art, Iran. ^ a b One or more of the preceding sentences incorporates text from a publication now in the public domain: Chisholm, Hugh, ed. (1911). "Brocade" . Encyclopædia Britannica. 4 (11th ed.). Cambridge University Press. pp. 620–622. ^ a b Ye, Lang; Fei, Zhengang; Wang, Tianyou, eds. (2007). China: Five Thousand Years of History and Civilization. Hong Kong: City University of Hong Kong Press. p. 410. ISBN 978-962-937-140-1. ^ Sullivan, Michael (1999). The Arts of China (4th ed.). Berkeley: University of California Press. ISBN 0-520-21876-0. ^ a b Tortora, Phyllis G. (2009). Survey of Historic Costume. New York: Fairchild Books. p. 110. ^ Tortora, Phyllis G. (2009). Survey of Historic Dress. New York: Fairchild Books. pp. 147–148. ^ a b Tortora, Phyllis G. (2009). Survey of Historic Dress. New York: Fairchild Books. pp. 183–184. ^ Collier, Billie J. (2009). Understanding Textiles. Upper Saddle River, N.J.: Pearson Prentice Hall. p. 303. Wikimedia Commons has media related to Brocade. Wikisource has the text of the 1911 Encyclopædia Britannica article Brocade. Marypaul Yates. Fabrics A Guide for Interior Designers and Architects. W. W. Norton & Co.
Ventura, Carol. Maya Hair Sashes Backstrap Woven in Jacaltenango, Guatemala, Cintas Mayas tejidas con el telar de cintura en Jacaltenango, Guatemala, 2003. ISBN 0-9721253-1-0.